Just in time for heating season, Testo has released two new combustion analyzers. The Testo 310 and its big brother the Testo 320 offer a full array of combustion analysis features, packaged in a field-tough housing, and priced almost irresistibly. While the 310 is ably equipped for residential use, the 320 is aimed at both residential and commercial applications. The new Testo 310 Residential Combustion Analyzer brings new features, new design, and outstanding pricing to reliable, worry free combustion testing. The 310 includes a bright backlit display, 10 hour battery, and strong magnets to keep you working under any conditions. 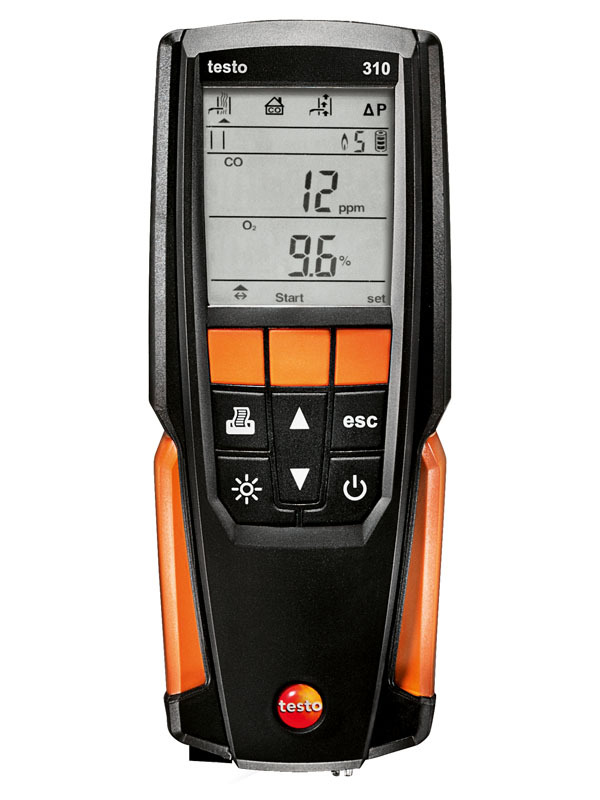 The Testo 310 measures CO and O2, and calculates CO2, combustion efficiency, excess air, and CO air free. Like other Testo combustion analyzers, the 310 includes an NOx filter as standard equipment, ensuring that your CO measurements are accurate. Additionally, the 310 can measure draft and pressure, temperature in the room and the flue, and ambient carbon monoxide. The probe incorporates a very accessible filter, while the instrument has an integrated, easy to drain condensate trap. With all these professional features at such a competitive price, the Testo 310 will prove to be a reliable, long term solution for residential combustion analysis. The Testo 320 Commercial Combustion Analyzer features the same great design and housing as the 310, but offers a wider array of analysis tools and optional probes. The 320 is built around a high definition color display, giving users more of the data faster. With the flue gas matrix you can monitor a user defined parameter (CO for example) over time, graphically seeing how adjustments have affected overall performance. The bright display can show from two to eight parameters at one time, without scrolling down, so you can get the whole picture without taking your hands off your work. Like the 310, the Testo 320 measures CO and O2, and calculates CO2, combustion efficiency, excess air, and CO air free. The 320, however, features field-replaceable long life sensors expected to last up to 3 years, and the instrument itself will monitor the sensors. The Testo 320 also measures draft and pressure, temperature in the room and the flue, and ambient carbon monoxide. 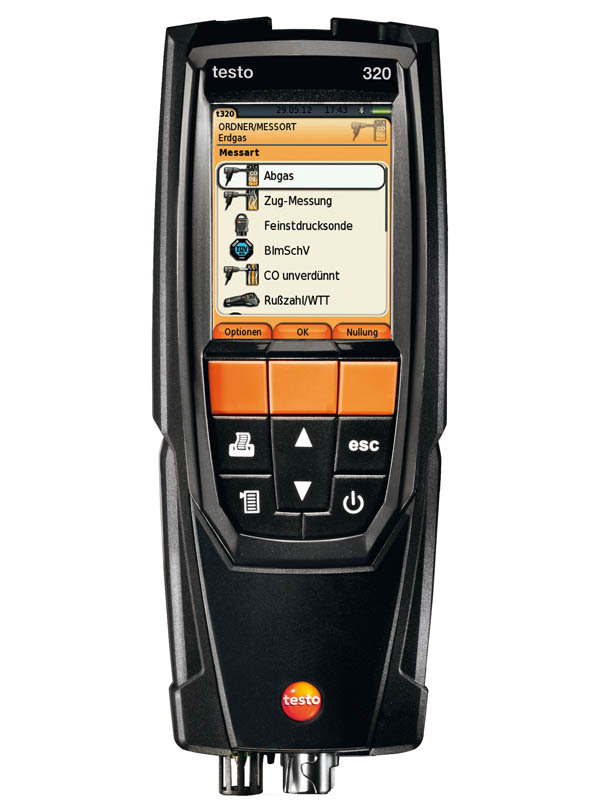 The Testo 320 can store and recall up to 500 readings and customer data. One great feature of the Testo 320 is the ability to connect optional probes. Use the Differential Temperature Set for better analysis of supply and return flows. Or connect the Ambient CO probe to measure room and flue CO simultaneously. The Gas Leak probe can locate and record levels of a combustible gas leak. Even check indoor air quality (IAQ) with the optional Ambient CO2 probe. With the 310 and 320 Testo has again raised the bar for rugged, reliable performance in combustion analysis for the HVAC professional, maintenance engineer, or energy auditor. All this while lowering one important bar as well–price. That’s an impressive combination. For pricing and specifications on either the new Testo 310 or new Testo 320 combustion analyzers, give us a call at (877) 273-2311, or navigate to IvyTools.com.